With the New Year come New Years resolutions. Save more money, lose weight, cook more meals, get out of debt...those are just a few of the most common resolutions made each year when the ball drops and we ring in the new year. What are your goals and resolutions? Perhaps trying to go just a little greener this year should be on your list of things to accomplish. Trying to be a little greener doesn't have to mean that you rush out and invest in pricey solar panels so that you can generate your own electricity, sometimes all you need to do is improve the green things that you already do. When I was just starting out cloth diapering I didn't have enough cloth diapers to make it through a whole day, but with each cloth diaper I did change I kept in mind that was one less disposable that I was putting into the landfill. The more cloth you use the better off we all will be. Baby steps are ok. Don't be of the philosophy that if you can't do something all the way that you shouldn't try it at all. Every little bit counts! Give cloth wipes a try! Just like cloth diapers, the more cloth wipes you use, the less disposables you're throwing away. Too scared to make the switch completely? Try using cloth wipes when you're at home and save the disposable wipes for when you're out and about. Recycle more! 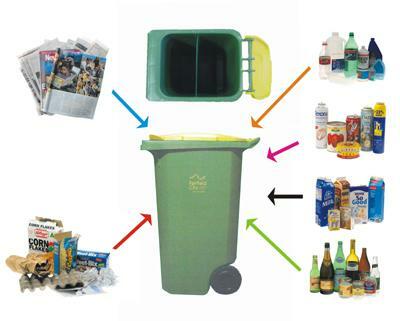 Recycling is one of the easiest ways you can green up your lifestyle. Give it a try! Almost everything comes in recyclable packaging these days and it's not until you really start to recycle that you realize just how much you've been throwing away that you didn't have to. Jars, soda cans, soup cans, cereal boxes, toilet paper rolls, food boxes....The list goes on and on. I was at a family members house over the holidays and noticed they'd begun recycling. I was thrilled but then I realized that they weren't recycling glass. Of all the recyclables glass is the easiest in my opinion, so I gave them a bit of a hard time and gave them a little push to maybe start recycling their glass bottles. So maybe that's all you need, just a little encouragement to try and recycle a little more than you normally do. Conserve water! Conserving water can be as easy as taking shorter showers, less baths or simply turning the water on and off while you're brushing your teeth or rinsing your dishes. Our house is on a well so every time I run the water I also run the well pump, so using less water means using less electricity too. Switch to cloth mama pads or a menstrual cup! Step outside of your comfort zone and ditch those disposable pads and tampons. Try out some of the great reusable options out there! Use less paper products! Paper plates and paper towels can be such a waste. Make your own reusable flannel "un-paper" towels and try making your own snack bags! You'll be amazed at how much you can save. Well these are just a few of my ideas on easy and inexpensive ways that you can go green or greener. The best part, going green helps save money too! So do you plan on doing anything like these for the new year?